An host supporting VST 2.4 SDK is required for using the plugin. 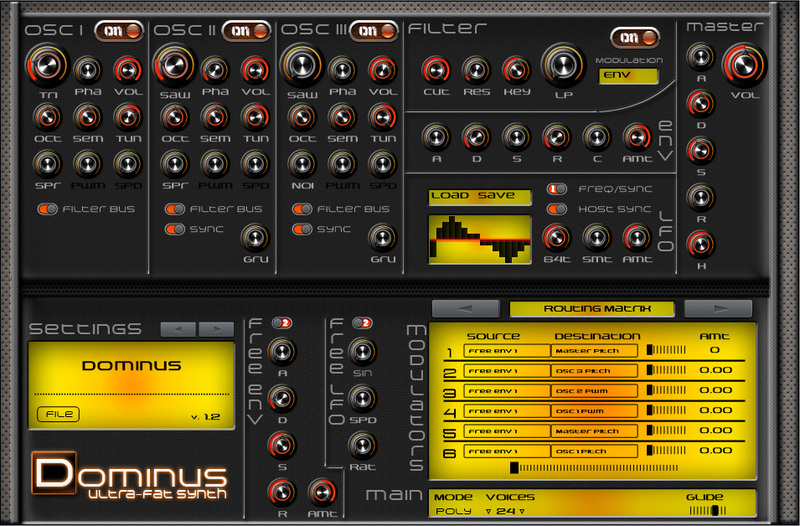 Dominus is a virtual-analog synthesizer for windows designed for generating fat and nasty sounds. This synthesizer is extremely flexible and powerful; could run Unison up to 4 voices and Poly up to 24 voices per channel. A built in spread technology allow non-linear detuning of oscillators sounding four per oscillator; SuperSaw's possible. Dominus is simple looking, simple to learn but incredibly deep. The novice producers will find it simple to learn and explore while PRO's get lost in a full immersion of complex sound generation! 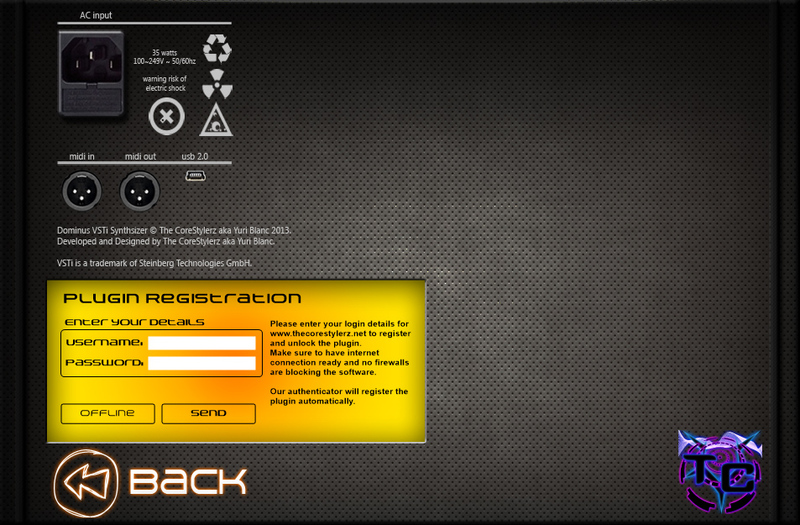 It routing matrix allow to modulate anything inside the plugin from internal free sources or MIDI inputs. Dominus can modulate up to 12 parameters inside it's routing matrix. A brilliant arpeggiator, fully controllable step by step like a sequencer, allow to create complex melodies and riffs in seconds. The core of Dominus uses a non-linear detuning technology that allow to sound one oscillator as four. Oscillators are detuned for a particular period based on an algorithm, and configurable by turning the "Spread" control knob. By turning "Spread" control, Dominus enables three more oscillator sounding the same wave and detune in 4 different conditions. This function allow to make really fat sounds, and many more harmonics than a single oscillator. You can obliviously make SuperSaws! The Dominus Spreading technology consumes much more CPU, about x3 times the normal oscillator when enabled. Serious low-level (assembly) have been made to make dominus fast.